Work continues on the locomotive with progress being made on the machine shop front. With temperatures a little over 80 degF in Ians workshop at school it’s time to make some more progress on the Klinger valves. All 4 bodies have had all the internal machining completed and are ready to be drilled for the cap mounting stud holes. Just waiting for a drilling jig to be made. 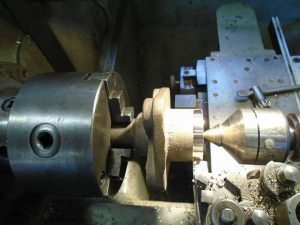 The 2 large caps are machined inside and out and are awaiting jig drilling plus the interesting part- Machining the metric trapezoidal thread. Another one of our members has volunteered to create all the spring hangers and fittings for the trailing truck and bogie. The Society has provided all the material for the work and if anyone would like to contribute towards the cost please do get in touch. 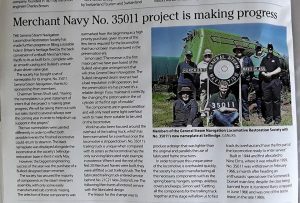 The project was featured in this month’s Heritage Railway magazine which was a roundup of the Society’s efforts over the last year. Its great being able to get some coverage in his particular title which will hopefully gain us some supporters. 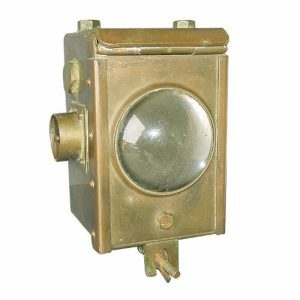 The Society is delighted to announce we have acquired a brass lamp fitted with the bullseye lens, toggle switch to side and bulb holder inside. The lamp is reported to have come off Merchant Navy’ Class No. 35024 “East Asiatic Company” and was purchased at a recent Railwayana auction. Gaining the lamp is fantastic news for the project as the use of original components helps add character to the locomotive. The lamp is part of a number of items that have been loaned to the Society on a loan term lease by one of our members to be used on 35011. Members will be able to read about the other components in the next issue of the Packet out in late September. Lastly the Society was saddened by the death this month of project supporter and Bulleid 4DD Double Deck EMU Supporters Group Committee Member Ian Ross. Ian was a great friend of the project and helped publicize the project in the early days. His loss at such a young age came as a complete shock and our thoughts are with his family and friends at this terrible time. I’m Martin Fowler and Ian Ross of the 4DD Group was my uncle my mums brother. We were like brothers as he was 53 and I am 46. Thank you so much for the kind words he was so knowledgable and was a great man. We miss him very much. We are sorry for your lose, Ian was a gentleman who we got to know quite over the last couple of years. With both of our projects being based at Sellindge we’ve been working closely together for a while now with Ian being the main contact for the 4DD. I’ll miss our talks about railways and real ale.